Sensō-ji (金龍山浅草寺 Kinryū-zan Sensō-ji) is an ancient Buddhist temple located in Asakusa, Tokyo, Japan. It is Tokyo's oldest temple, and one of its most significant. Formerly associated with the Tendai sect of Buddhism, it became independent after World War II. 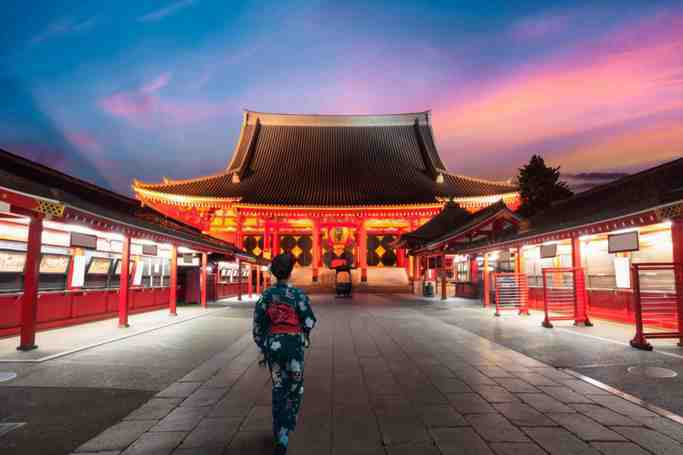 Adjacent to the temple is a Shinto shrine, the Asakusa Shrine. 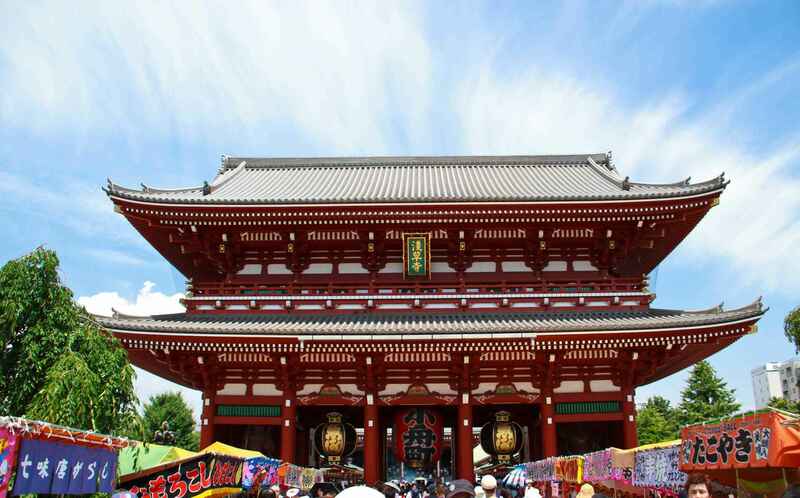 Sensō-ji is the focus of Tokyo's largest and most popular festival, Sanja Matsuri. This takes place over 3–4 days in late spring, and sees the surrounding streets closed to traffic from dawn until late evening. Dominating the entrance to the temple is the Kaminarimon or "Thunder Gate". This imposing Buddhist structure features a massive paper lantern dramatically painted in vivid red-and-black tones to suggest thunderclouds and lightning. Beyond the Kaminarimon is Nakamise-dori with its shops, followed by the Hōzōmon or "Treasure House Gate" which provides the entrance to the inner complex. Within the precincts stand a stately five-story pagoda and the main hall, devoted to Kannon. 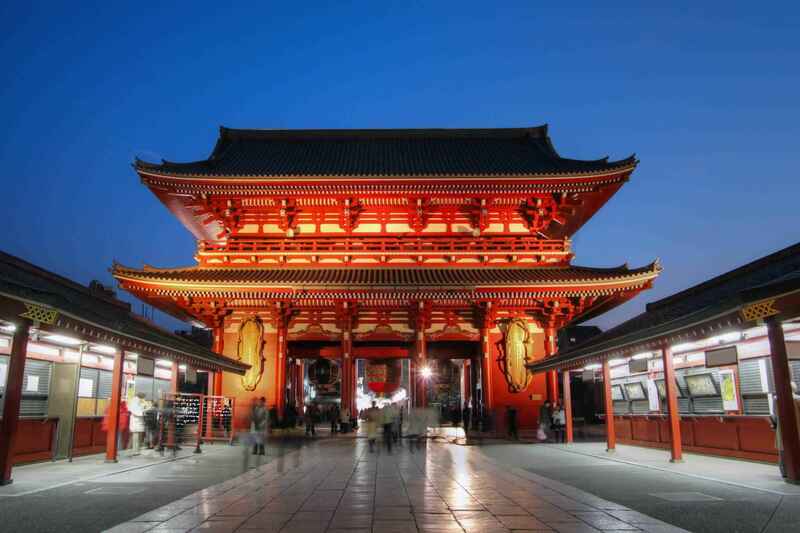 Many tourists, both Japanese and from abroad, visit Sensō-ji every year. Catering to the visiting crowds, the surrounding area has many traditional shops and eating places that feature traditional dishes (hand-made noodles, sushi, tempura, etc.). Nakamise-Dori, the street leading from the Thunder Gate to the temple itself, is lined with small shops selling souvenirs ranging from fans, ukiyo-e (woodblock prints), kimono and other robes, Buddhist scrolls, traditional sweets, to Godzilla toys, t-shirts and mobile phone straps. These shops themselves are part of a living tradition of selling to pilgrims who walked to Sensō-ji. Within the temple is a quiet contemplative garden kept in the distinctive Japanese style. The Nakamise-dōri (仲見世通り) is a street on the approach to the temple. It is said to have come about in the early 18th century, when neighbors of Sensō-ji were granted permission to set up shops on the approach to the temple. However, in May 1885 the government of Tokyo ordered all shop owners to leave. In December of that same year the area was reconstructed in Western-style brick. During the 1923 Great Kantō earthquake many of the shops were destroyed, then rebuilt in 1925 using concrete, only to be destroyed again during the bombings of World War II.